A Jacob's ladder is a folk toy consisting of blocks of wood held together by ribbons. The strings are affixed in such a way that a block can tip in only one direction. When the ladder is held at one end, blocks appear to cascade down the strings. However, this effect is a visual illusion that�s the result of one block after another flipping over. In �chain reaction�, eight Jacob�s ladders are connected to one another. Each block has two colors (light in front, dark in back) and can thus indicate two states to the user. The toy thus becomes a dynamic display. 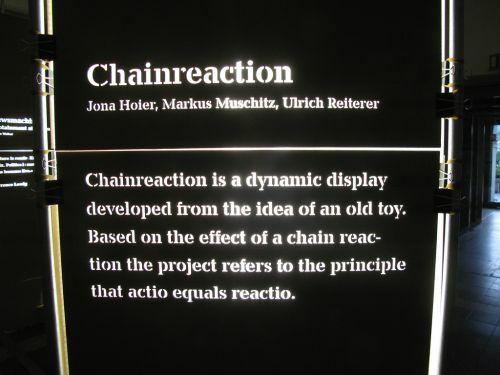 Based on the effect of a chain reaction this installation refers to processes which humans are exposed in every day life. Exemplary binary coded graphics demonstrate these processes in an abstract way. Exhibited at Forum Stadtpark (02/2007) and Ars Electronica (09/2007) A sofa23 installation by Jona Hoier, Markus Murschitz and Ulrich Reiterer, see sofa23.net for further information.